I won't lie, this mod is a bit silly. It started as a joke in my IRC channel and now here we are. Hey I loved this mod when I played with it on a server with my friends. Will you please continue and update the mod? Please Update this mod. Please! While I was browsing modpacks, I just so happen to know the solution to this. You'll need to add Lumy Skin Patch to any 1.7 modpack including anything with heads or skins. Hate to be that guy, but I've gotta ask, will the 1.7.10 version be updated so it doesn't crash? 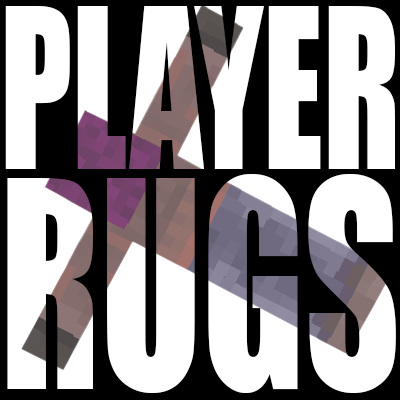 Have this in a private modpack for me and some close friends but crashing every time a rug is broken gets quite annoying. Other than that, this is one of my favorite mods. Does the latest 1.9.4 version work on MC 1.10.2? KK, thank you for responding. As a suggestion you may want to mark it as supporting 1.10.2 so more people know. Can you provide a log with the error message? so the error only shows up in latest on the server side, no error anywhere on the client side. its doesnt happen when placing the rug, only when breaking the rug. gives same error whether its broken off a wall or from the ground. Huh, swear I fixed that issue. The 1.8.9 version crashes if you enable renaming the rugs on an anvil in the config ... May you fix that ?